There's nothing like a bowl of home made beef stew on a cold day! This version is dressed up with biscuits baked on top and you'll want to make this one again and again! 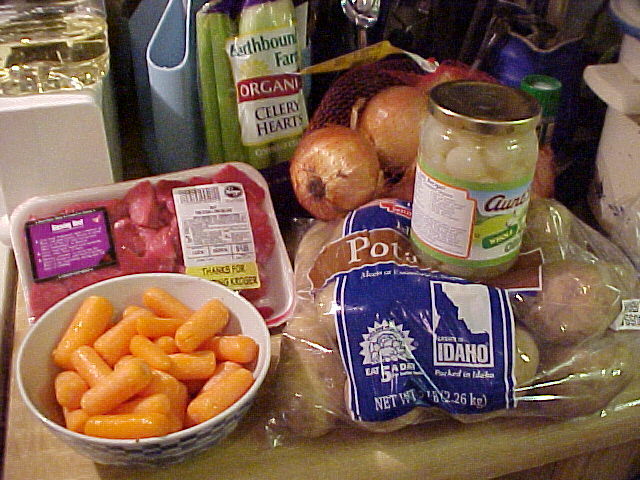 Here are your major ingredients to make a great beef stew! 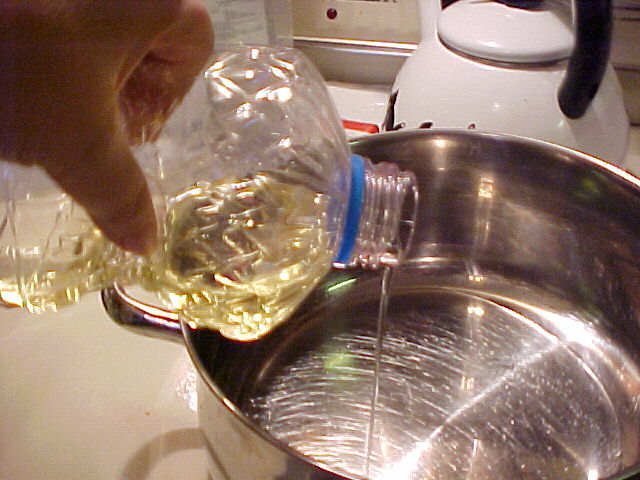 Add your cooking oil to the bottom of your big cooking pot and heat it up. 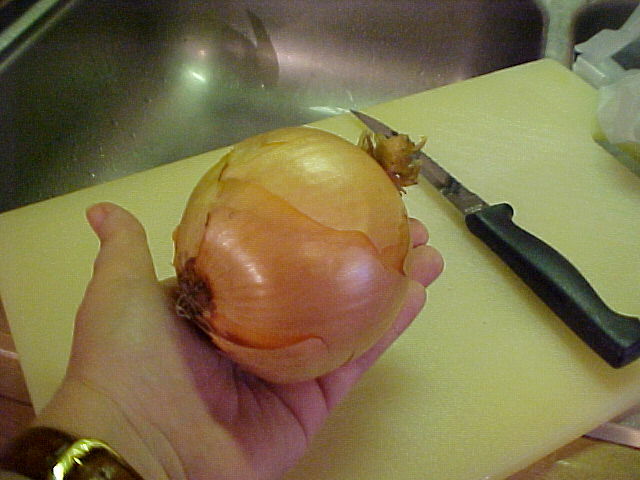 Peel and chop one large onion (or two small or one and a half medium). 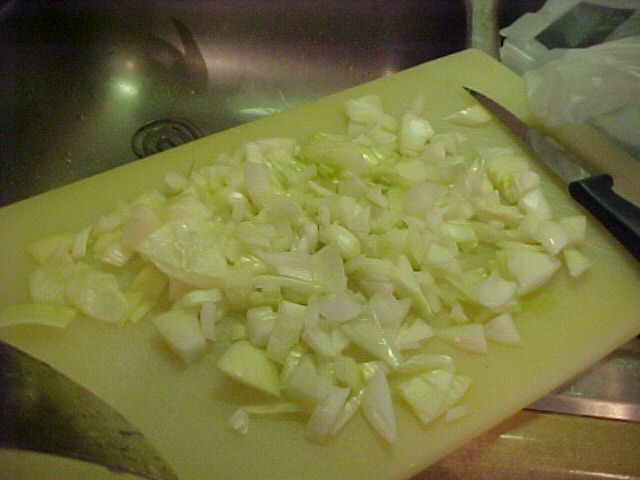 Chop onions and then add them to the oil. Once onions are cooking, add flour, salt & pepper to large zip lock bag. 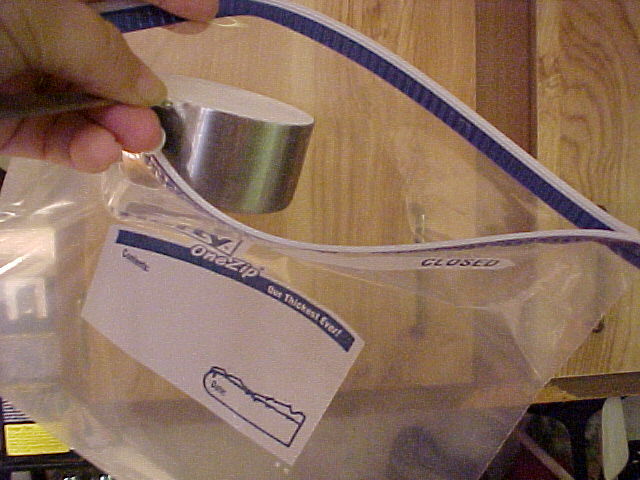 If a zip lock bag isn't handy, use a clean bread bag or a resealable plastic container. 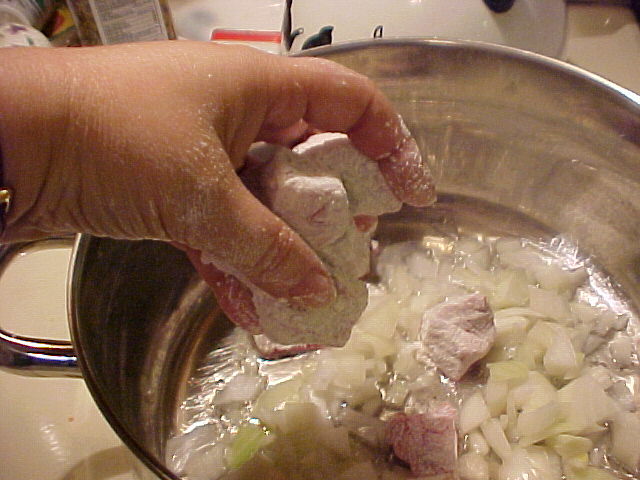 In a pinch you could put the flour, salt and pepper in a large bowl and roll or dredge the beef cubes in it. 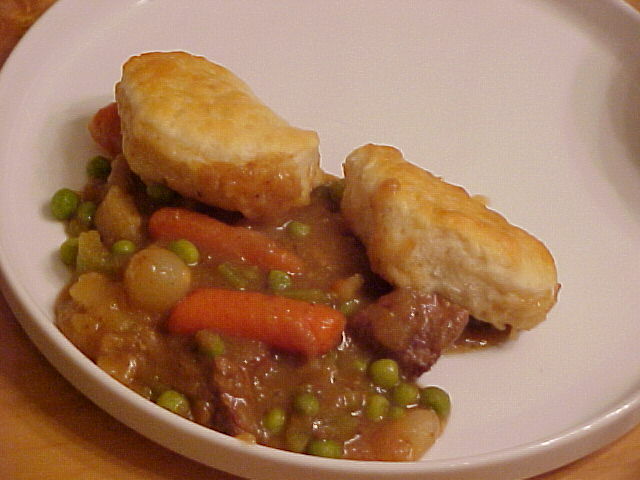 The main thing is that you want the beef cubes coated well with the flour. 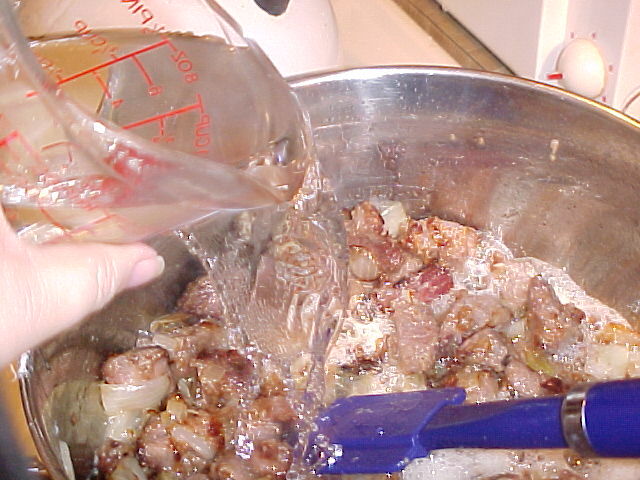 Place the flour coated beef cubes in your hot oil with the onions. 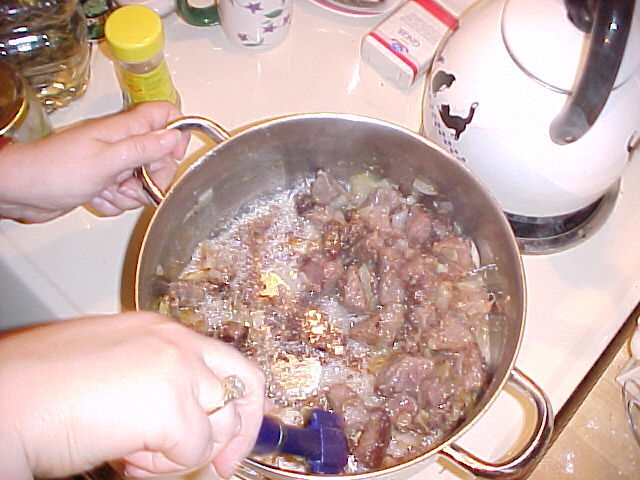 It is very important for your stew that you cook the beef cubes till they are very browned. How browned? So brown that they are ALMOST burned but NOT QUITE. Why? 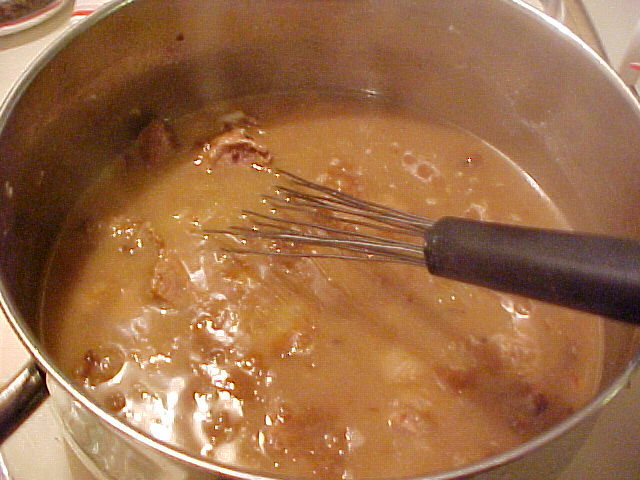 Because this is how your stew gets brown gravy! Turn them occasionally so they get cooked on all sides but try to let them cook undisturbed as long as you can. You'll be glad when you get to the next steps. Don't be timid on this! You don't want stew with GRAY GRAVY!!!! Periodically, turn the beef cubes and scrape the bottom of the pan so the flour doesn't stick. While beef is browning with the onions, peel and chop your potatoes, prepare your carrots (you can use whole baby carrots that come already peeled OR regular carrots, washed, peeled and sliced -- this is your choice), chop about 4 nice stalks celery and set aside. Don't make the potato cubes too small as they will be cooking for quite a while. Add 3 C. water & scrape bottom of pan thoroughly (this is called deglazing). Notice the nice brown color -- this comes from the browned beef. 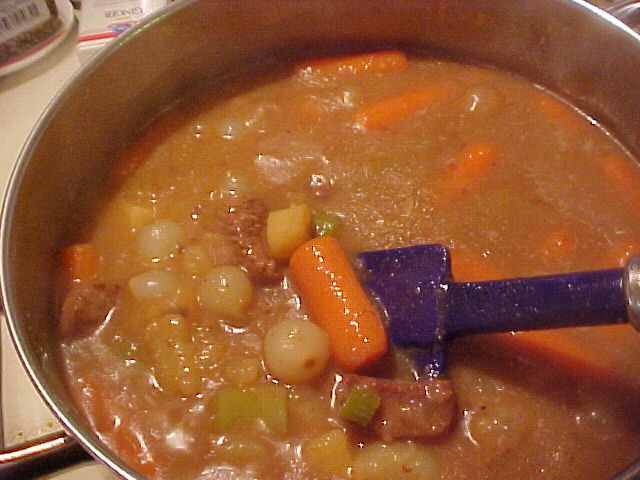 Add carrots, potatoes, celery, pearl onions & rest of water & simmer on medium heat for 1/2 an hr. During this process, your stew will be boiling nicely. Be sure to periodically scrape the bottom of the pan with a good spatula to keep it from all sticking on the bottom and burning. The burnt taste will NOT enhance the flavor of your dish. 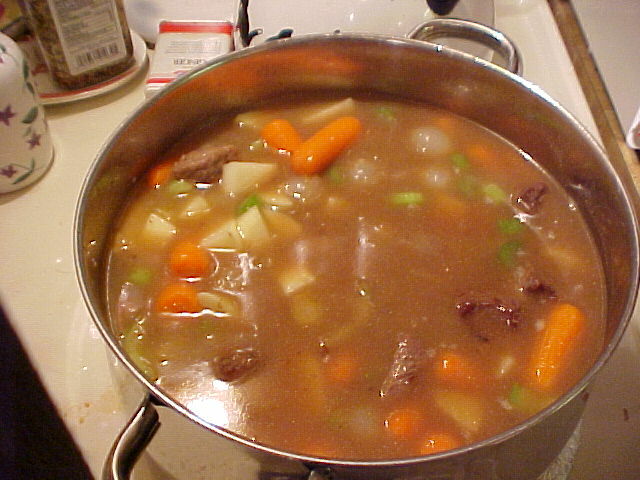 Note: Your stew should be thickened by a combination of the flour from the beef cubes (now all cooked away into the gravy) and some of the flaky potatoes adding their own thickening. 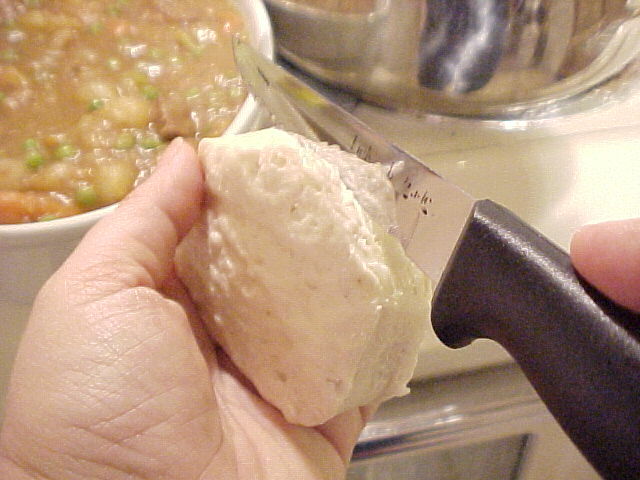 But, just on the off chance that your stew isn't thick enough, here's how you fix it. Take about 3 TBS. of flour in a cup or small bowl and mix in just about the same amount of water. Stir with a fork so that you have a paste. Stir a little of your gravy into this -- again using a fork and then stir all this into your gravy in the pot and let it boil a minute or two. This should be all you need to thicken your stew. [If it gets too thick, stir in a bit more water.] Also note that your stew will thicken a bit more after it starts to cool down so the gravy can be a little bit thinner than you like. This is one of those things you may have to try once or twice before you get it just exactly the way you like it, but you should have fairly good results right from the start. 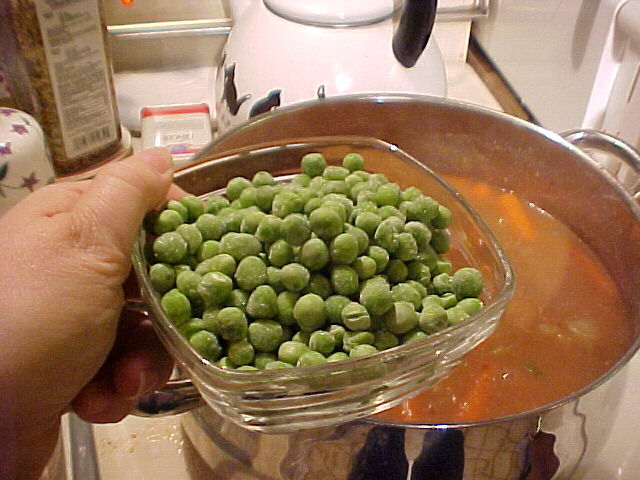 At this stage, you could add some frozen peas, if you like them. This is a good time to taste your stew and see if it needs more seasoning. Because potatoes absorb salt, you probably will need to add a little more. Simmer for about an hour -- a little longer won't hurt as the beef will get more tender the longer it cooks and then you can either serve it "as is" in bowls OR you can go the next step and really make it nice. I am not going to go into biscuit recipes at this stage. 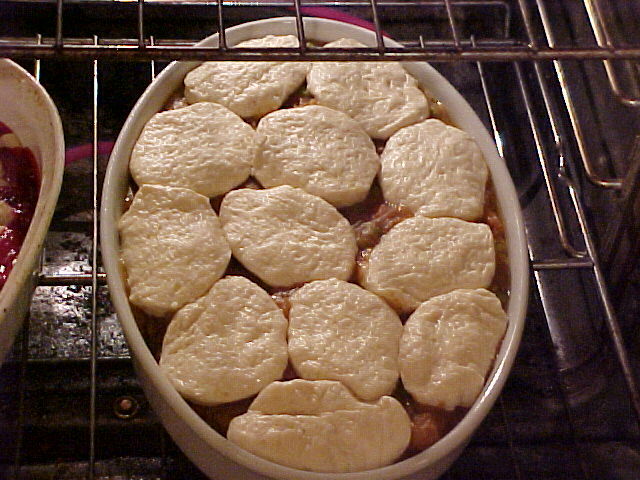 Use your favorite recipe, a biscuit mix or the refrigerated biscuits. With either home made or mix ones that you roll out, roll them fairly thin, about 1/2 an inch thick. I find that the refrigerated ones work quite well but do cut them in half longways so that they aren't quite so thick. Spray cooking spray on a large baking dish and ladle your stew into the dish. 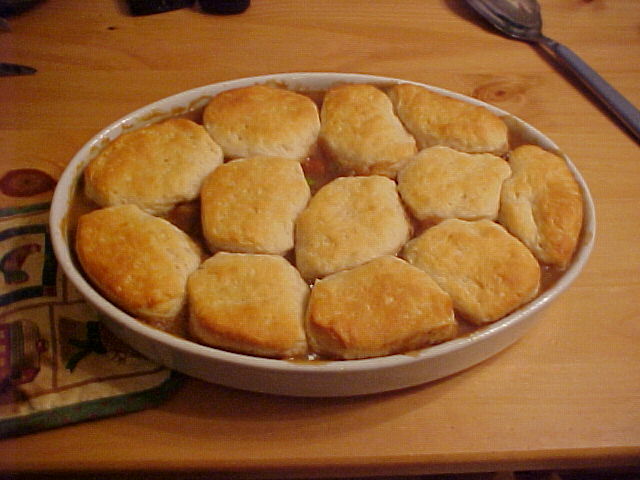 Slice the biscuits and place on top of the stew in the baking dish. Bake in a preheated oven at 350° for approx. 15 min. till nicely browned. Serve immediately. Add a salad and a beverage and you have your whole meal, right here! Click here for printable version of this recipe.